“The story is interesting, unique, and fun, and the puzzle is challenging to solve ahead of the heroine.” Read more…. “An exceptionally engaging mystery thriller from beginning to end…. A deftly crafted novel that well prove to be an enduringly popular addition to community library Mystery/Suspense collections.” Read more…. 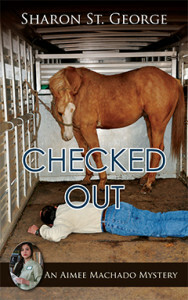 When rodeo cowboy Cody O’Brien is found dead in his horse trailer, it appears that his horse, Game Boy, is the culprit. Aimee Machado, health sciences librarian at Timbergate Medical Center, has no reason to doubt the preliminary finding—not at first. Cody had been in the hospital awaiting an operation the night he died, but he checked himself out. Had he reason to believe his surgeon, Dr. Phyllis Poole, was incompetent? Or is his death related to his complex relationship with his family? It turns out his father is dying, and four people other than Cody stood to inherit: his young trophy wife Echo, his son James, his daughter Keely, and her fiancé Tucker. How does Dr. Poole fit into all this? Her surgical outcomes have not been the best. Not to mention that Laurie Popejoy, TMC nurse and Poole’s rival in the hospital’s blues combo, disappeared the night of Cody’s death. Aimee is highly motivated to investigate. She once had a crush on Cody’s brother James, who has now set his sights on her. The missing nurse, Laurie, left Aimee a desperate phone message the night she disappeared. Moreover, Aimee’s friend and co-worker Cleo has elicited her help to discredit Dr. Poole. Aimee is already confused romantically. Although it pains her, she is trying to keep Nick, the pilot she loves but does not trust, at arm’s length. But his help proves too invaluable to refuse. Can Aimee ferret out the truth without losing her job and her life? “Hello, Aimee, remember me?” A deep voice, vaguely familiar, pulled my attention from the computer screen. A man who looked about forty walked in. He was dressed in faded jeans, scuffed cowboy boots, and a gray plaid Pendleton shirt. As he walked toward my desk, his broad smile told me he expected a warm welcome. His wavy hair was reddish-brown and his face was familiar, but the name wouldn’t come. No one called me Aimless except Harry. How did this guy know that nickname? Then it struck me. James O’Brien. Cody and Keely’s older brother. He used to drive Keely to and from the dance studio where we took lessons when we were eight years old. He was eighteen then, and my infatuation with him was sweet misery. It didn’t help that he flirted with me shamelessly, telling me that when I was all grown up he was going to marry me. I stopped believing him when he moved to New York right after my thirteenth birthday. I cried every night for a week. Seeing him now, I felt a flush of pleasure warm my cheeks. “Of course.” I walked around my desk and tried for something tepid and platonic. “You call that a hug?” He wrapped me in his arms with the warmth of a long lost lover, rocking my body back and forth. Then he kissed the top of my head. I felt myself melting, and when he released me, I stepped backward, unsteady on my feet. The man smelled like dessert. Lemon meringue pie.